I cannot remember a time when my family did not get a daily paper but I can remember how ticked off we would be when what we got was a wet paper. And, here in the 21st century, we’re still getting them. I do not know when newspapers were first delivered to a person’s home on a subscription basis but I remember the Los Angeles Examiner and later the Herald-Examiner, and still later the Los Angeles Times being delivered to our home in the San Gabriel Valley. My little brother had a paper route for the Her-Ex (an afternoon delivery). I’d help him fold and wrap the papers on a rainy day and did the Sunday morning delivery, as he was a “late” riser. We made sure that the papers were delivered in the middle of the driveway or on the front porch of the subscriber – dry. If something went wrong (wet paper) you either got a phone call from the subscriber or an earful when you went door to door to collect the month’s subscription fee. You’d think, or at least I would, that in the intervening half century publishers would have figured out how to get newspapers delivered to their subscribers dry – especially considering their ongoing fight with digital media. But this does not seem to be the case. Today my paper was thrown in my wife’s rose bushes and our automatic sprinklers (M-W-F) soaked it through. Perhaps I should clarify things – I subscribe to two papers the LA Times and the Orange County Register (both are delivered by the same person). 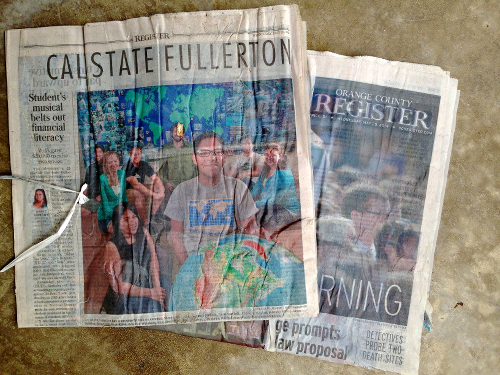 The OC Register was soaked through and the LA Times was thrown in the middle of the driveway and was dry. On previous occasions when I’ve contacted the Register or the Times I’ve gotten a polite reply and another paper was delivered later that morning. Not today. Today I was chided for not reporting small problems previously and no replacement paper was delivered – it is now almost 11 am. The issue was – today my paper was wet and unreadable. And I still don’t have a copy of today’s Register – ah well, what can you expect for $40/month? Hey, I think I’ll send Customer Service a copy of this post and a link to this blog. Hmmmm – and a copy to the Publisher/Editor too.